Home » mist » myanmar » Misty morning in Bagan, Myanmar! Myanmar (also known as Burma or Birma) is a country in south east Asia extending from the southeastern end of the Himalaya mountain range southwards into the Indian ocean. The terrain is to a large extent mountaineous, with only the central region around the Ayeyarwady river being plain. 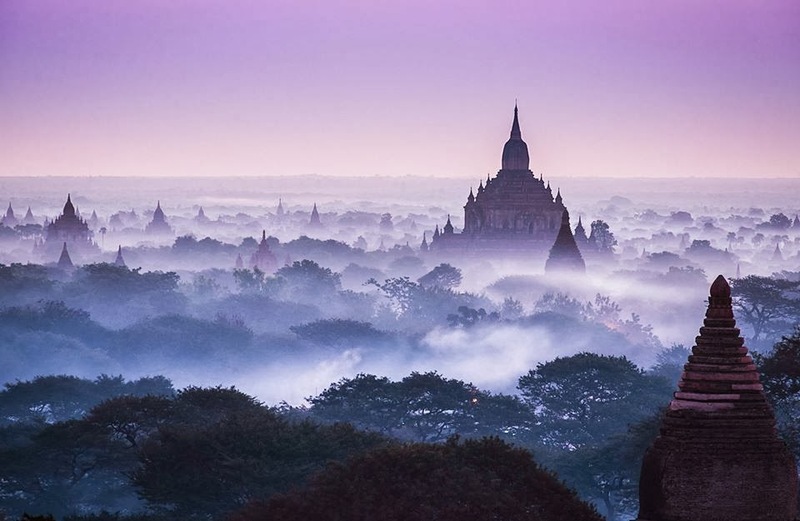 Myanmar extends for 2000 km from north to south and has widely varying climatic regions, ranging from a temperate and fresh north to a tropical south. The first identifiable civilisation in the region is the one of the Mon, who by the mid-900s BC were the dominant power in southern Myanmar. Later a number of kingdoms developed in the region. These were first unified by the kingdom of Taungoo in the 16th century. In the 19th century the British conquered Myanmar and incorporated it into the British Raj. Myanmar became independent in 1948 initially as a democratic republic. Following the coup by the military in 1962, Myanmar has been ruled by the military ever since. Its economy nowadays is underdeveloped, also due to the economic sanctions imposed by the international community. When visiting Myanmar one gets the impression that the country is like Thailand was 30-40 years ago: little traffic in the streets, old cars, most men wearing traditional sarongs, very little crime. The capital of Myanmar was Yangon until 2005, when the capital was moved to Naypyidaw, a new city located 320km to the north.